In a world with a lot of confusion, the film “God Grew Tired of Us” helps bring our dispirited lives into focus. Some movies present a tiny moment that makes a fair film good, but this one, directed by Christopher Dillon Quinn and Tommy Walker, is a great film, and little moments in it make it exhilarating. 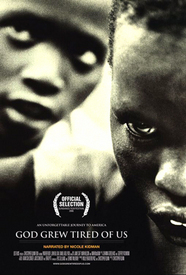 This is the second mass-distributed movie about those who have escaped the human misery and warfare in Sudan, and who have resettled in the United States. While we in the U.S. may think of ourselves as generous hosts, the young Dinka men at the heart of this film teach us a thing or two about humanity. “God Grew Tired of Us” takes a critical look at what happens 10 years after 12,000 children take a 1,000-mile trek, first from Sudan to Ethiopia, and then, as the political situation in Ethiopia changed, a subsequent forced trek to Kenya. Words can’t even begin to describe the pictures of a 1,000-mile trek where mud and urine are the most nutritional food. You won’t find that in your L.L. Bean catalog. The film compares this incredible, horrifying trek in Africa with the coldness and isolation that the young men experience in the U.S. Hearing these men articulate both experiences is a testament to the human spirit and something that may never have been documented in film before. One of the resettled youths goes missing for three days. It turns out that he started acting strangely on a bus in Syracuse, N.Y., and was taken to a psychiatric hospital. Without giving away too much, picture a kitchen in an apartment where the young men are learning what light switches do and how toilets work. Later we see one of them dump Ritz crackers into a pot, crush the crackers with the handle end of a hammer and pour in some milk. I’m not sure why, but I felt like I was catapulted out of my seat by this scene. While the struggle is continuing in southern Sudan, it’s interesting to see what is happening in the reel world as it relates to this real world. Helen Mirren (“The Queen”) has reason to expect an Oscar, and rightly so, for portraying the queen of England as a wonderful and tough woman imprisoned by the pomp and circumstance of her position on a tiny island in the North Atlantic. Yet it was Britain’s tentacles that stretched across and strangled the Third World and left northeast Africa saddled with arbitrary boundaries. Those boundaries partially account for the current crisis. “God Grew Tired of Us” gives us clues about the bigger picture and proves once again that when we only know half the story, we will be thirsty enough to want the whole thing. Maybe we should be “sentenced” to live and walk on a trek with the Dinka. Maybe we would forever be cured of the curse of being from a country that eats Ritz crackers with a Martha-Stewart-inspired shot-out-of-a-global-warming-aerosol-can of something called “processed cheese food” in a country that “elects” a cheating George Bush to represent us for the whole world to see.